East High School sophomore Jah'nee Pearson became concerned after watching a documentary in her environmental sciences class about the effects various plastics – including Styrofoam – can have on animals and fish that ingest them as food. A whale in the film had thousands of pieces of plastic in its stomach. "He choked off it, and that's how he died," she said, casting her eyes down toward her desk. "So to see animals ... die from a lack of oxygen, and it all comes from plastic ... it's crazy." Jah'nee and her classmates had previously attended a Common Council committee meeting to voice support for a ban the Council is considering on expanded polystyrene, or EPS, commonly called Styrofoam. 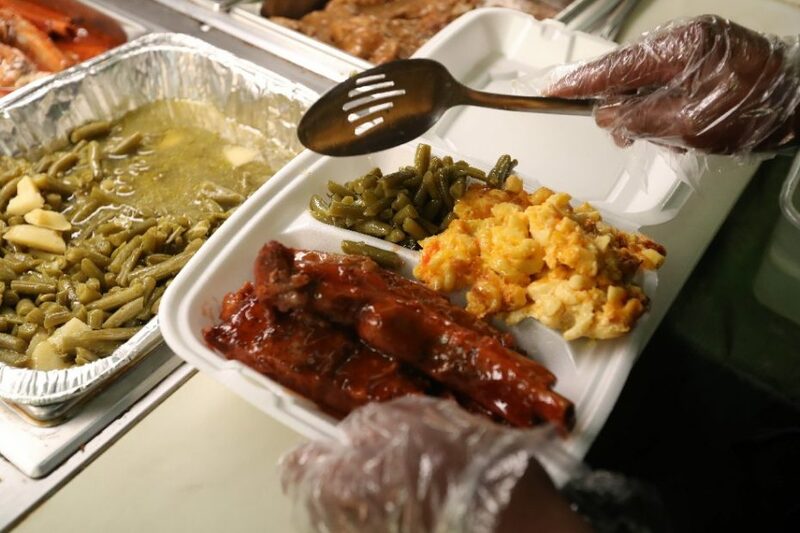 Buffalo's discussion comes on the heels of New York City's ban that went into effect earlier this year after its Sanitation Department determined that food-soiled foam containers could not be included in the city's curbside recycling program in an economically and environmentally effective way. So beginning Jan. 1, stores and food businesses could no longer offer foam food containers such as cups, plates, bowls, trays and coolers or loose-fill foam packaging called "packing peanuts," according to the city's website. Affected businesses have a warning period through June 30, but beginning July 1, establishments violating New York City's foam ban will be fined. "I'm not going to be looking at any legislation for the next 30 days to give people a chance to write letters, to get with our institutions of higher learning and to really get scientific data," Council President Darius G. Pridgen said during a March 26 committee meeting. "I want to see the science to know that whatever decision this Council eventually makes that we have the scientific data from those who have studied this." Stakeholders on both sides have been vocal. Calling Styrofoam "one of the least expensive containers on the market," Christine Cassidy told the Council committee a ban would create an economic hardship for restaurants. Cassidy is recycling manager for Dart Container, a manufacturer of food service containers and items, including Styrofoam. In a subsequent telephone interview, she cited coffee shops as an example. "When a coffee shop has to switch to paper or compostables ... the price can go up two or three times," she said, if shops currently using Styrofoam cups have to resort to putting a paper cup inside a second cup or providing java jackets to protect customers' hands. "Either they eat the cost or pass it onto the consumer," Cassidy said. "If they have to eat the cost themselves, it can eat away at some of the profits. ... It does add up throughout the year. They may not be able to hire another person." Mehmet Hujdini, owner of Gino & Joe's Pizzeria in the Main Place Mall downtown, acknowledged that he signed one of the letters, but he was so busy at the restaurant at the time that he wasn't completely aware of what he was signing. "I didn't even know what he was talking about," said Hujdini, referring to the man who approached him with the letter. He added that he voluntarily stopped using plastic bags two months ago "because we want to support the community." He uses Styrofoam takeout containers in his restaurant because they work better for the type of food he serves, "especially the chicken, and the sauce and stuff because" paper containers leak, he said. But if the city bans Styrofoam containers, he won't have a problem with the decision and will probably convert to clear plastic containers even though "the price (of the plastic) compared to (foam) is almost three times more expensive." The Styrofoam costs him about $16 or $17 per case, compared to $60 to $70 per case for plastic, he said. It's a cost he's willing to eat and not pass onto the customer if a Styrofoam ban is implemented, though he could not estimate how much the cost containers contribute to the price of a takeout meal. 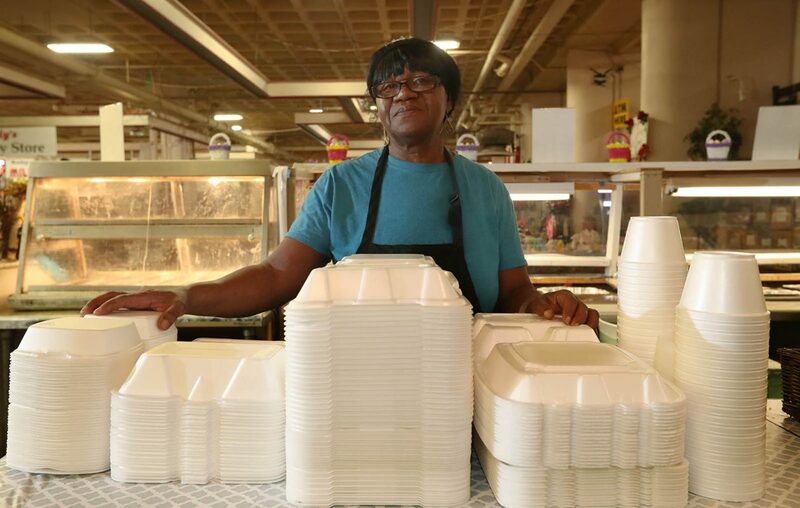 Margie Hawkins – owner of Margie's Soul Food, a takeout-only restaurant in the Broadway Market – serves practically all of her food in foam containers placed in paper bags. Hawkins, who also signed one of the letters that Cassidy presented, opposes a ban on Styrofoam containers because they're cheaper and, like Hujdini, she says they're convenient for the types of food she sells. "Paper, that's no good because ... I put greens or peach cobbler or something in there, the juice can come out. You can be walking with that bag, and the next thing you know your food is on the ground because it has gotten wet," she said. Health hazard ... or not? Reusable containers and packaging made from biodegradable and compostable materials are alternatives to the foam items, which pose health threats to humans, animals and fish, said John. S. Szalasny, an executive board member of the Sierra Club Niagara Group. When broken down into smaller fragments, the Styrofoam resembles food to some wildlife that starve because their stomachs are full of the waste they eat, Szalasny told the committee. As for the impact on humans, "chemicals in Styrofoam such as styrene and benzene are known carcinogens and leak into food and drink when they are heated. Styrofoam does not biodegrade but will leach over time into groundwater supplies," he said. But Cassidy argued that the American Cancer Society says "that food service polystyrene is fine to you," and the fact that hospitals use Styrofoam is a strong indication that it's safe. "When you look at some of these bans, the first person that is exempt are hospitals. That's where you go to get well and hospitals use foam, and if there really was a carcinogen that would cause health issues, hospitals would be the first ones to get on the ban list to get rid of it," she said. Neither the American Cancer Society nor its sister organization, the Cancer Action Network, has a position on Styrofoam, Kim McMahon, communications director for American Cancer Society Northeast Region, said by email. But McMahon pointed to the organization's website, which lists known and probable human carcinogens. Styrene – a component of EPS or Styrofoam – is among them. The lists were developed by the International Agency for Research on Cancer and the National Toxicology Program, which described styrene and other products on the list as "reasonably anticipated to be human carcinogens." Once EPS foam has been "contaminated with food residues, oils, alcohols, there's not a market for them," said Szalasny. And he said it comprises about 30 percent by volume of the waste that ends up in a landfill. "That is completely incorrect," Cassidy countered, referring to a 2017 waste categorization study conducted by New York City's Sanitation Department. The report was conducted before the ban on foam was proposed. "New York City ... did the study and foam is .7 percent of their waste. That's food service foam. That's less than 1 percent in New York City ... I doubt Buffalo has 29 percent more than New York City," she said. There are several companies that will recycle contaminated foam, Cassidy said, including Plastics Recycling Inc. in Indiana that will take the foam municipalities collect curbside and "wash it, dry it and then recycle it." But Buffalo and the rest of Erie County do not provide curbside recycling collection of Styrofoam containers or packaging. As for markets for used Styrofoam, there are "plenty of buyers throughout the United States that are buying this material, including picture frame companies, crown molding, office products," she said.